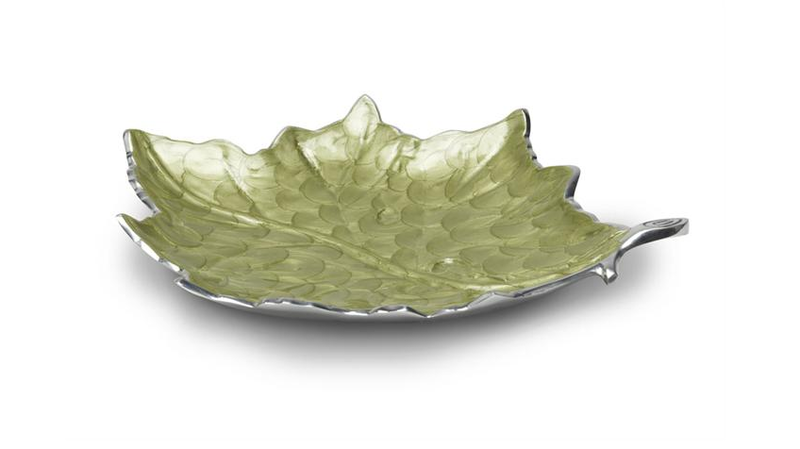 A Grape Leaf Platter from Julia Knight’s new line of serve ware make a great platter for appetizers. It’s made from sand-cast aluminum and enamel with crushed mother of pearl. Product designer Julia Knight, who’s brimming with ideas on how to entertain simply and stylishly, is a firm believer that, when it comes to food, presentation is as important and preparation. Julia recently introduced a new line of serving pieces that make even ordinary fare, like crudités and snacks, look extraordinary. Tip 1: “Goat cheese is an easy and elegant hors d’oeuvre. Before guests arrive, I top it with a dollop of lemon curd (you’ll find it in the jams and jellies section),” says Julia. “Pair it with a wedge of a local organic blue cheese and a cluster of grapes on a cheese board and you’ll have a lovely presentation of cheeses without toiling all day!” She likes to serve the goat cheese in her 8-inch Amethyst Argento Glass Serve Ware bowl, which is microwave and dishwasher safe, and the blue cheese on her Saffron Cheese Board. “The amethyst and saffron make a gorgeous harvest palate,” she says. 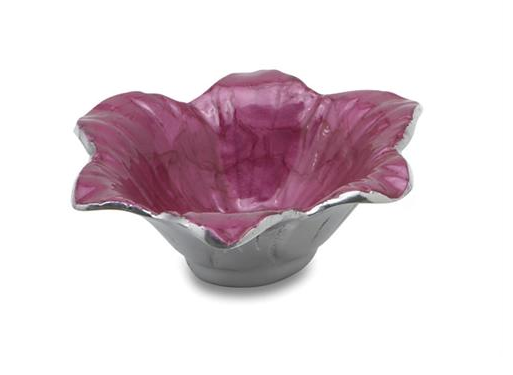 The enameled Lily Bowl from Julia Knight’s line of serve ware is a great container for nuts and snacks. For more information on Julia Knight’s line of serving pieces and where to buy them, visit her Web site. I recently came across your web site and have been reading along. I thought I would leave my very first comment. Nice blog.I will keep visiting this website very frequently. Thanks so much for your nice comment. Would love to hear more from you in future. So glad you plan to keep visiting often!